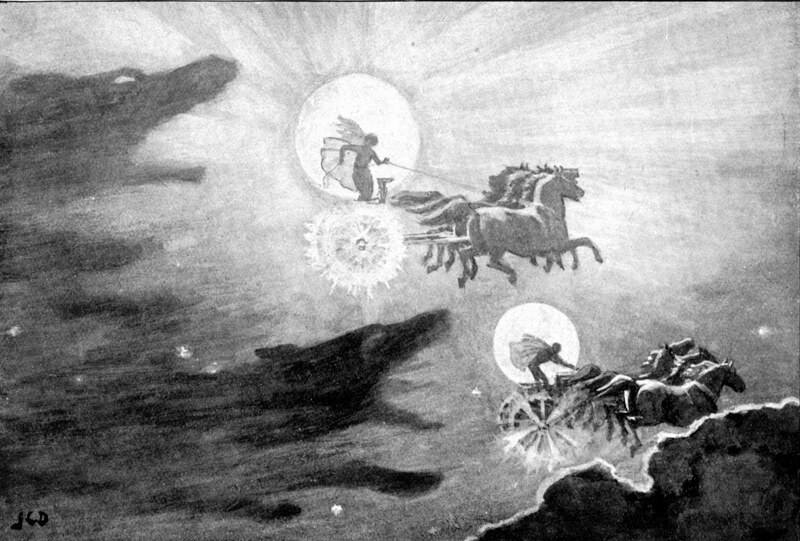 "Each day Sun and Moon were pursued by the enormous wolves Skoll, Hati, and Managarm. Kept by Angur-boda, fed on the bone marrow of murders and adulterers, of which there was no end, they grew stronger and stronger. Each day they got closer to Sol (Sun) and Mani (Moon) until one day their jaws closed around them and the life was crushed out of them. Their blood dripped from the wolves' jaws and poured down on the earth." - Barry Holstun Lopez, Of Wolves and Men, pp. 275-276. Artwork: "The Wolves Pursuing Sol and Mani" by J. C. Dollman, 1909.